It still amazes me how much access I get to some crazy hip hop memorabilia moments!? Last week, eight big crates of furniture, clothing and gym equipment that were seized from Death Row Records’ founder Marion “Suge” Knight were auctioned off to pay off his debts. This second auction comes four years after Suge Knight sought bankruptcy protection and didn't compared to last year's, but nor do the prices. Only a modest $4,500 was raised for storage costs of Conejo Valley Moving & Storage Co.
“Sorry Suge, but now I’m going to sell your crap!,” announced auctioneer Dan Dotson as he kicked off the quick 30-minute sale. 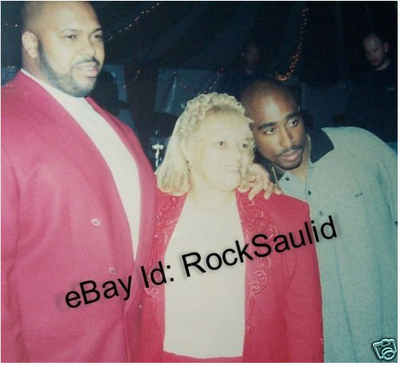 The photo of Suge Kinght and Tupac was sold for $100. It's now on eBay for $500 currently...nice move, fella! Rewind...Auction #1 How much would you pay for the replica electric chair that is the logo for Death Row Records? "It's a piece of memorabilia of hip hop and Death Row," said Dale Fletcher, owner of Hostility Clothing, an extreme sports clothing brand who paid $2,500 for this hip hop icon in January 2009. 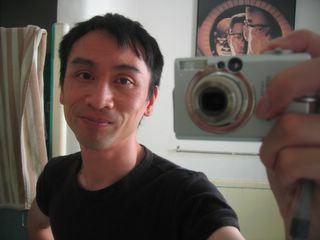 "I'm definitely a fan of all the Death Row people, especially Tupac (Shakur)." Bargain basement Fans and merchants alike headed to Fullerton, CA to get their hands on some of the booty on offer. Retailer Grover Winberly bought six pallets of albums to sell in his store and online. Some of it as low as $0.20 a piece. "Death Row stuff has always been in demand," he said. "The retail price on a CD is $12. We got a good deal." But he also did show some heart, "Death Row Records was always good to retailers," he said. "It's a sad day, especially when you see them selling off the guy's underwear and stuff." Everything had a price tag The auction included hip hop memorabilia and promo materials, ranging from platinum records, autographed photos and miscellaneous merchandise like the box of "Tha Doggfather" flashlights. Even a Bible belonging to Suge Knight sold for an astonishing $325! Snoop Dogg's MTV Award for "Best Rap Video" sold for $1,500. The Orange County Register reported: "The cultural gaps between the two auctioneers - both older men with gray hair and glasses - and the auction attendees were often obvious and created lots of laughs throughout the day. Mistakes were quickly corrected by the attendees, such as when the auctioneers said "gangster" rather than "gangsta" when referring to the Death Row compilation album "Too Gangsta For Radio," or when they pronounced Tupac as "Two-pack." Stephen Grove, president of Kohn-Megibow Co. which ran the auction, joked with the friendly crowd: 'Half of you are packing anyway, right?'"